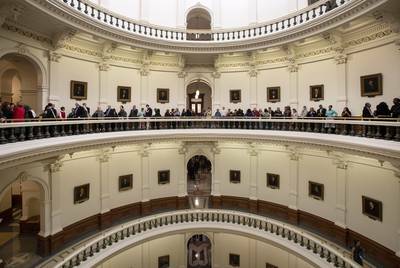 "Photos from the new Texas Legislature's first day" was first published by The Texas Tribune, a nonprofit, nonpartisan media organization that informs Texans — and engages with them — about public policy, politics, government and statewide issues. 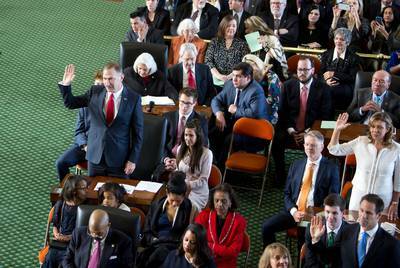 Photos from the new Texas Legislature's first day By The Texas Tribune January 8, 2019 New lawmakers were sworn in, a new speaker of the House was elected and a lot of celebratory speeches were made on the first day of the 86th Legislature. 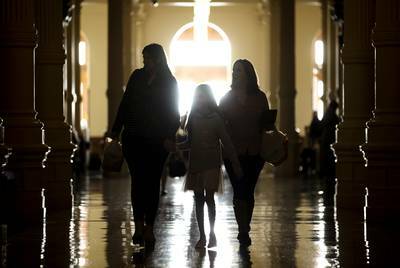 We sent three photographers to the Texas Capitol to capture the moments. Here are some of their shots: Left to right: Beatriz Ozuna, Bella Maldonado and Klaudia Nevarez walk into the state Capitol on the first day of the 86th legislative session. 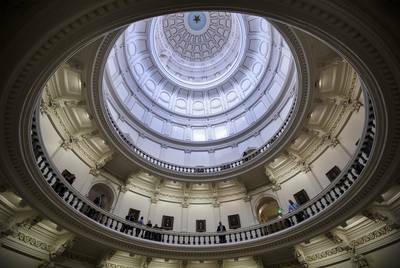 Miguel Gutierrez Jr./The Texas Tribune Chyrece Campbell holds Pierce Campbell as he looks up at the rotunda at the state Capitol. Chyrece and her children, also pictured, Madison, Gregory and Kennedy, were visiting the Capitol on the first day of the 86th legislative session. Miguel Gutierrez Jr./The Texas Tribune Visitors at the state Capitol wait in line to enter the House chamber. 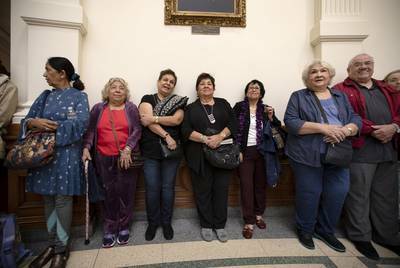 Miguel Gutierrez Jr./The Texas Tribune Left to right: Farhat Chishey, Julia Alderede, Kathy Medrano, Juanita Belt, Carmen Rodriguez, Hardy Melchorn, Vera Gomez and Robert Gomez wait in line to enter the House chamber. 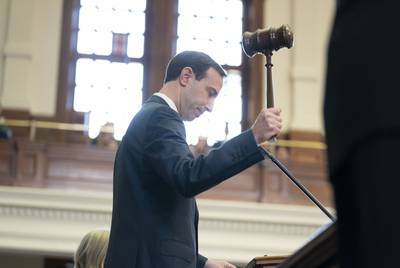 Miguel Gutierrez Jr./The Texas Tribune Texas Secretary of State David Whitley gavels in the 86th legislative session. 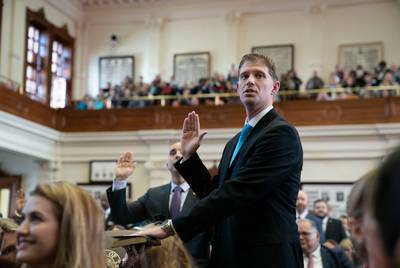 Bob Daemmrich for The Texas Tribune State Rep. Matt Krause, R-Fort Worth, joins other lawmakers in taking the oath of office. Bob Daemmrich for The Texas Tribune State Rep. Dennis Bonnen before he was elected House speaker on Tuesday, Jan. 8, 2019. Bob Daemmrich for The Texas Tribune State Rep. Senfronia Thompson, D-Houston, gives a seconding speech in favor of electing state Rep. Dennis Bonnen as the new House speaker. 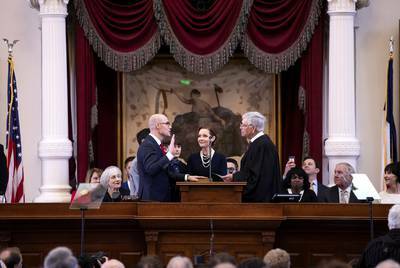 Bob Daemmrich for The Texas Tribune State Rep. Dennis Bonnen, R-Angleton, is sworn in as House speaker by U.S. District Judge John D. Rainey on Tuesday, Jan. 8, 2019. 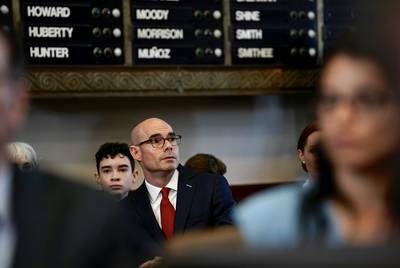 Looking on is Speaker Bonnen's wife Kimberly. 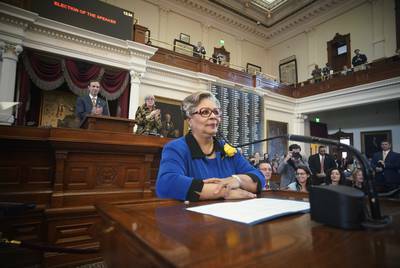 Miguel Gutierrez Jr./The Texas Tribune On the Senate side, state Sen. Jane Nelson, R-Flower Mound, gavels in. That duty would ordinarily fall to Lt. Gov. Dan Patrick, but he was in Washington, D.C. today, attending a border security meeting at the White House. Marjorie Kamys Cotera for The Texas Tribune State Sens. Charles Schwertner, R-Georgetown (standing, left), and Joan Huffman, R-Houston (standing, right) take the oath of office. 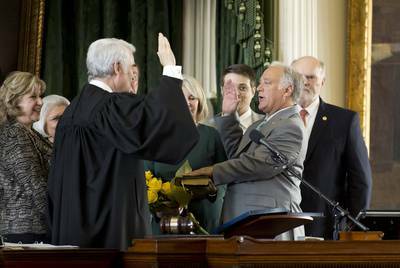 Marjorie Kamys Cotera for The Texas Tribune State Sen. Kirk Watson, R-Austin, is sworn in as Senate president pro tempore by Texas Supreme Court Chief Justice Nathan Hecht. Looking on are Sen. Jane Nelson, R-Flower Mound (far left), and Robert Nichols, R- Jacksonville (far right). Marjorie Kamys Cotera for The Texas Tribune The rotunda at the state Capitol. At most there are 139 days left until the Legislature adjourns sine die. Miguel Gutierrez Jr./The Texas Tribune Read related Tribune coverage Texas House names Dennis Bonnen new speaker on celebratory opening day "Photos from the new Texas Legislature's first day" was first published at by The Texas Tribune, a nonprofit, nonpartisan media organization that informs Texans — and engages with them — about public policy, politics, government and statewide issues. 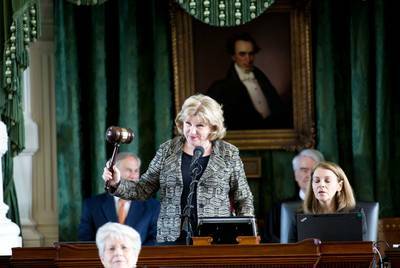 Link back to the original article, which is located at https://www.texastribune.org/2019/01/08/day-one-86th-legislature-pictures/.